To kick off the winter season in style, 6202 hosted a mountain bike demo ride up Ridgeline in Castle Rock followed by a chili cook off and party. The day started off with espresso at Lost Coffee and quickly turned into mountain bike demos presented by American Cycle Sport and Bike Source. Members sported their epic ugly holiday sweaters for a snow-packed and slightly muddy ride through Ridgeline trail. Then the party got started with a chili cook off back at Lost Coffee. Members and their spouses submitted their best chili recipe for a chance to take home the green bowl trophies while 6202 will take care of the sides, drinks and fine, paper serving dishes. There were two categories awarded. Bart Ranger took home the trophy for the Board’s Favorite chili. Bob Keller’s chili *cough* really his wife’s *cough* took home the hardware for People’s Choice. The real prizes were awarded slightly earlier. Three club members were recognized for their contributions to the club and outstanding performance on the bike for the year. 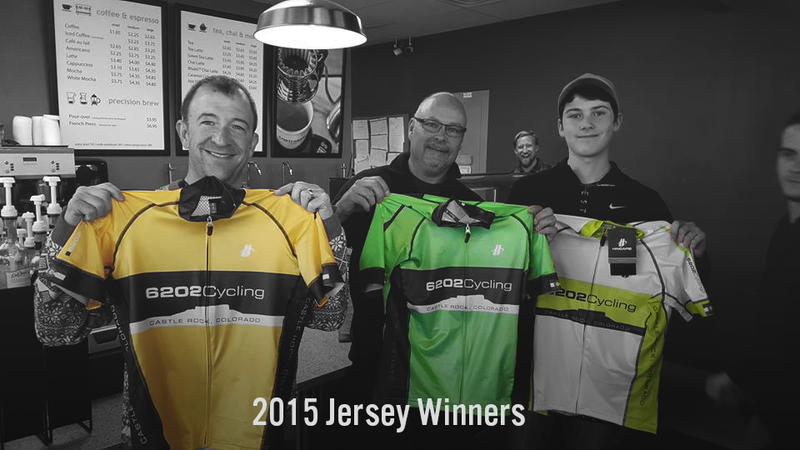 Best Overall Rider was awarded Jim Bergantzel in the form of a special yellow jersey. Jason James took the green jersey for Biggest Contribution. In 2016, the young Robbie Keller will be riding in a white jersey for being voted as 2015’s Most Improved Rider. The day was a blast and we couldn’t have done it without our sponsors and club mates. A very special thank you goes out to Erin Kristensen for putting so much time and energy into the event, making sure it was a success! 2015 was a fantastic year for 6202 Cycling, and we are thankful for everyone that contributed to it!